In an effort to keep and attract new container shipping lines, Klaipeda plans to reduce its port dues for large container ships, informs LETA/BNS. The Cabinet on Wednesday approved the respective proposal from the Transport Ministry. Klaipeda's vessel, navigation, berth, sanitary and port waters dues are currently calculated based on the gross tonnage specified in the International Ship Tonnage Certificate. 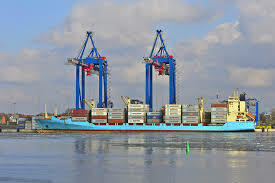 However, ships with a capacity of over 60,000 TEUs cannot be fully loaded in Klaipeda due to insufficient depth. "If a ship is larger and has a higher TEU capacity, which is quite common in ocean shipping, up to 60,000 units can still be loaded onto it in the Klaipeda port," Transport Minister Rokas Masiulis said during the Cabinet's meeting. "Unfortunately, the current system of charging in Klaipeda is such that a ship like that is charged based on its documented, rather than actual tonnage," the minister said. For this reason, large container ships are charged much higher dues in Klaipeda than in neighboring ports, he added. After the new rules take effect, port dues will be calculated based on the maximum gross tonnage of 60,000 units. The Transport Ministry estimates that, for example, port dues for a vessel with a gross tonnage of 131,800 units would decrease to 36,300 euros, from the current 72,100 euros. Port dues for such a ship in the Polish port of Gdansk would be still lower, at 25,100 euros. The ministry says discounts to ships with a capacity of over 60,000 units in Klaipeda would total up to 750,000 euros annually under the new pricing policy, but the financial benefit from increased traffic would be much higher. "We could expect an increase of 3.5 mln euros in revenue simply because we would attract more ships to the port," Masiulis said. The Klaipeda port handled 531,400 TEUs in January through September 2018, up by 58% compared with the same period of last year and more than in the full year 2017 (473,000 TEUs).